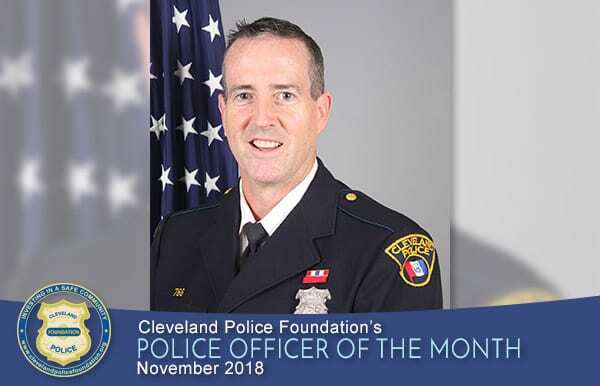 Recipients will receive a personal plaque in recognition of their good deeds, and perpetual plaques will be displayed at Cleveland Police Headquarters, the offices of the Cleveland Police Patrolmen’s Association, and the Fraternal Order of Police Cleveland Lodge 8 where they will serve as an inspiration to others. Commander, I would like to make you aware of the excellent community police work performed by PO Haggerty on Friday October 12, 2018 while working on B platoon. A 13-year-old boy with special needs was riding his bike on his way home to Parkmount Avenue from school. While crossing Lorain at Rocky River Drive, a car hit his bike. Luckily, he was not injured as he was able to get off the bike before it was struck. But his bike was not so lucky and was broken beyond repair. PO Haggerty, who handled the assignment, felt bad for the boy having lost his bicycle. The following day while working on A platoon, PO Haggerty purchased an orange Mongoose bicycle for the boy. She also stopped at Target and purchased a bicycle helmet, all with her own money. She was working a double that day so while on B platoon she stopped by the boy’s house on Parkmount to give the bicycle and the helmet to the boy and his mother. They were both very happy that the officer did this for them and extended their gratitude. Officer Haggerty is an excellent officer and always goes out of her way to help the citizens of Cleveland. I thought this incident was special and something that you along with the First District Community should know about. I would think for this effort PO Haggerty would be an excellent candidate for Officer of the Month. During this holiday season, it is especially important to remember our police officers who put their lives on the line every day. And it is also noteworthy that our officers care so much about our community. It is because of the devotion and dedication to the community she serves that we recognize Patrol Officer Samantha Haggerty as as the Police Officer of the Month for December 2018. First District Patrol Officer Louis Kitko is a tremendous example of an officer who cares for his community and the people he serves. Officer Kitko, a 20-year veteran officer, always has badges, coloring books, and child identification kits on hand in the First District lobby to pass out to children who stop by with their parents. He recently reached out to the Cleveland Police Foundation and personally purchased over $600 in Cleveland Police teddy bears to pass out while on duty. Whenever Cops for Kids has a fundraising event, Officer Lou continually volunteers to sell tickets and helps support and promote the events. The Cleveland Police Foundation and Cops for Kids want to thank Patrol Officer Lou for creating a better relationship between the Cleveland Police officers and the children we serve. It is because of this devotion we recognize Patrol Officer Louis Kitko as the Police Officer of the Month for October 2018. 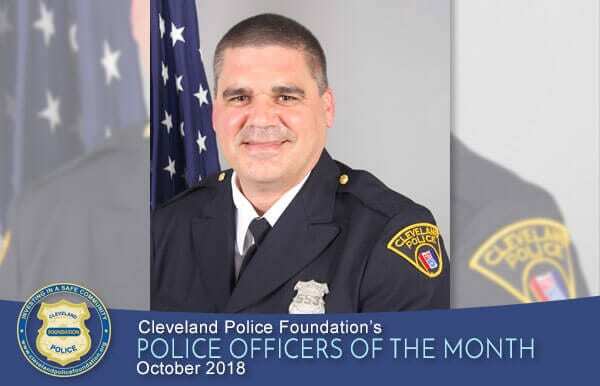 The Cleveland Police Foundation is proud to honor our officers on a monthly basis who go beyond the call of duty when practicing Community Policing in their respective districts. Our September 2018 recipients are a prime example of this. Fourth District Sergeant Jose Torres with Patrol Officers Rick Varnell, Albert Buccini, and Scott Floyd responded to an assignment for the death of a 21-year-old. The officers stayed on the scene to comfort the family, even purchasing lunch out of their own pockets. While on the scene, family Pastor Greg McCurry observed the officers and was so taken by their compassion and caring that he chronicled their visit on Facebook. 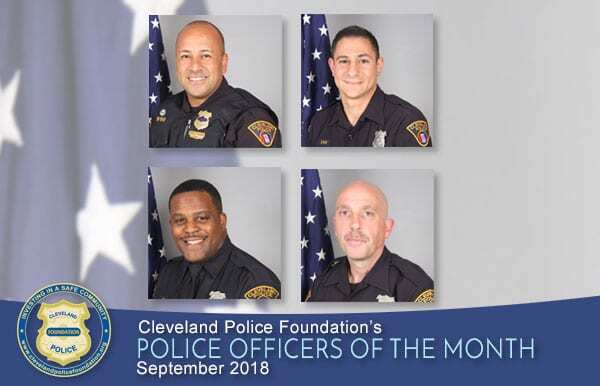 It is because of this compassion and caring that the Cleveland Police Foundation recognizes Sergeant Jose Torres and Patrol Officers Rick Varnell, Albert Buccini, and Scott Floyd as the Police Officers of the Month for September 2018. Although her day-to-day work assignment in the Cleveland Division of Police Homicide Unit is somewhat different, Sergeant Evelyn Montalvo is a strong advocate of Community Policing. Evelyn participates every year in the Cleveland Police Foundation’s Plane Pull at Cleveland Hopkins Airport to benefit the Special Olympics. She also donates generously to our CPF and Cops for Kids events, is an advocate for the mentally ill, and she volunteers countless hours to persons with disabilities. Sergeant Montalvo also cares about her community. 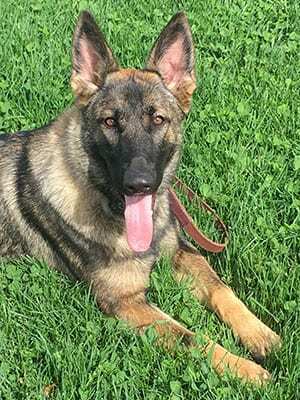 Recently, while walking her dog Khali she noticed a suspicious male wearing a hoodie in 80+ degree weather walking across the lawn and down the driveway of a Kamm’s Corners neighborhood resident. The sergeant then noticed the suspect entering a rear window. She called out to the suspect that she was the police and the suspect immediately dropped from the window and froze, not knowing if Montalvo was a canine officer and if Khali was going to attack. The suspect fled on foot, at which time Sergeant Montalvo returned to the front of the house and called 911 for assistance, relaying the description of the suspect and vehicle to them. Sgt. Montalvo remained on the scene until police arrived and ensured SIU would respond for possible prints. Approximately a week later, Sgt. Montalvo followed up with the extremely grateful resident, who expressed as much by a letter of appreciation for Montalvo’s actions. The resident sent the letter to Cleveland Police Chief Williams and the Kamm’s Corners Development Corporation, who also expressed appreciation and gratitude for Sgt. Montalvo, as a Cleveland Police Officer, and a neighborhood resident. 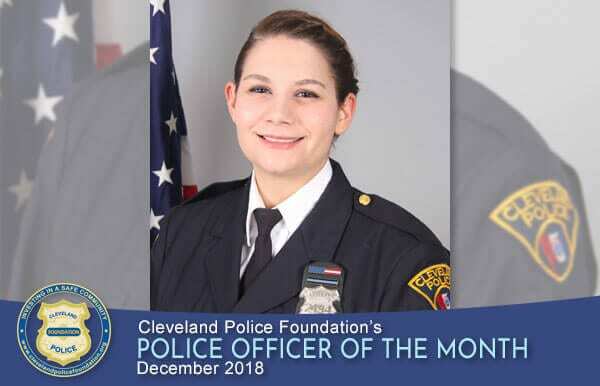 It is because of this dedication to the Community Policing concept and her caring for the community in which she resides that the Cleveland Police Foundation is proud to name Sergeant Evelyn Montalvo as Police Officer of the Month for August 2018. When Cleveland Police and the U.S. Marshalls apprehended an Athens, Ohio, father accused of abducting his children, Sergeant Steve Beckner jumped in with both feet to calm the children and mother. He immediately fed the infant child and then FaceTimed the mother to let her know that the children were fine. When the mom called the sergeant the next day telling him she could not find a ride to Cleveland to pick up the kids, he and Patrol Officer Chris Lane both volunteered to drive them the 3½ hours to Athens to reunite the family. 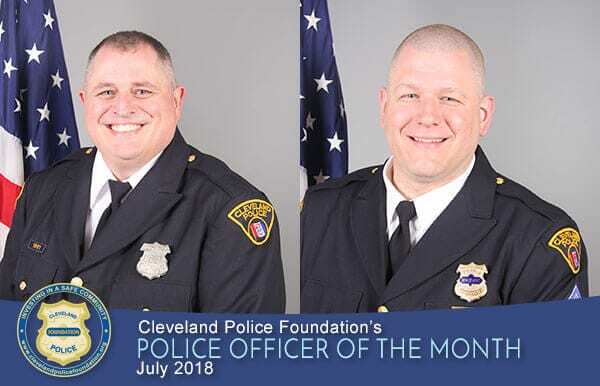 For their selfless actions in caring for the children and helping reunite them with their mother, the Cleveland Police Foundation is honored to recognize Sergeant Steve Beckner and Patrol Officer Chris Lane as Police Officers of the Month for July of 2018. Considering the short time the NICE (Neighborhood Impact and Community Engagement) Unit has been in existence, the officers have really shown a positive impact on community policing efforts in the City of Cleveland. 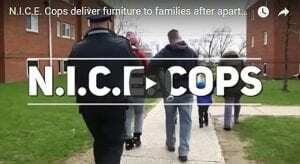 The NICE Unit officers recently pitched in and donated much needed furniture to the 30 families displaced by a fire at CMHA’s Rainbow Terrace Estates. The officers also donated household items and toys and moved furniture into the new residences located at Garden Valley Estates. The NICE Unit has also worked with New Jones Road Chapel in Building Community Cleveland and pitched in to clean up the neighborhood. The officers also make it a point to visit the Cleveland elementary schools to talk to the children and have lunch with them. 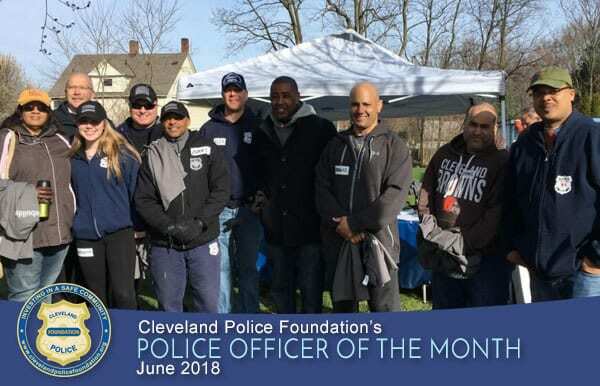 It is because of their mission to promote Community Engagement, making Cleveland neighborhoods stronger, and creating lasting relationships that the Cleveland Police Foundation is honored to recognize the NICE Unit with Police Officer of the Month Award for June 2018. 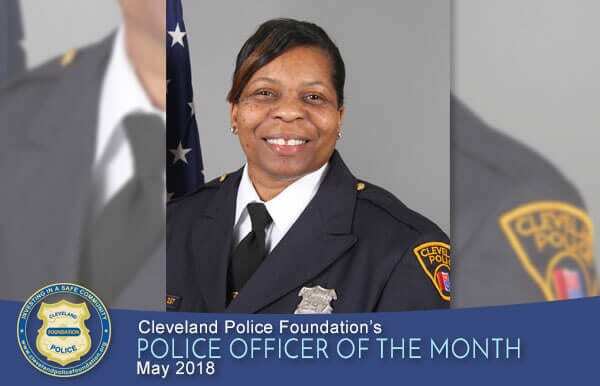 It is because of this dedication to her sisters and service to the community that the Cleveland Police Foundation is honored to recognize Officer Sharon Davis as its Police Officer of the Month for May 2018. Officer Hubert Kidd is an outstanding officer and an amazing asset to the Cleveland Division of Police Second District’s Community Service Unit. Officer Kidd became a CPD Officer in 2002 and automatically became the go-to guy when it came to community outreach with a smile and kind word for everyone he encounters. 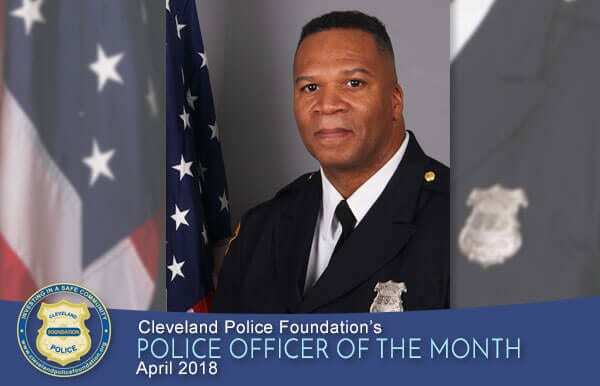 It is because of this dedication to our children and devotion to the community he serves that the Cleveland Police Foundation is honored to recognize Officer Hubert Kidd as its Police Officer of the Month for April 2018. 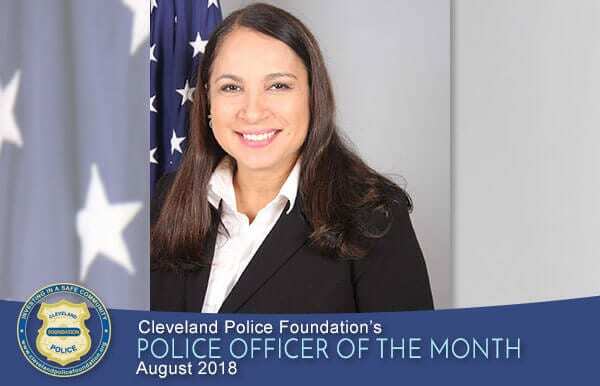 Detective Lisette Gonzalez of the Cleveland Division of Police Fourth District has always shown a great concern for the community she serves but as of late, that concern for people has expanded. Detective Gonzalez has gone to Puerto Rico twice on her own time since Hurricane Maria devastated that island. She has assisted with the relief efforts to get things back to normal and on multiple occasions, personally spearheaded fundraising for the cause. 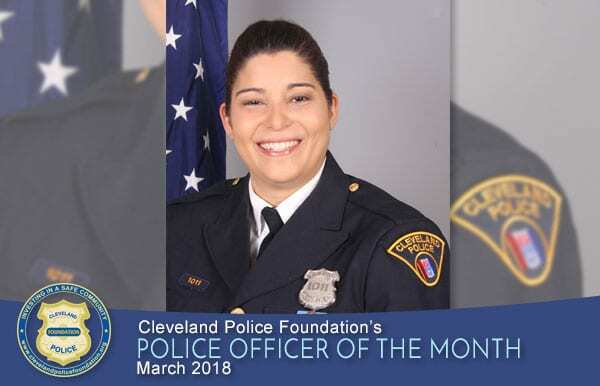 For her dedication and devotion to community service, the Cleveland Police Foundation is honored to recognize Detective Lisette Gonzalez as its Police Officer of the Month for March 2018. 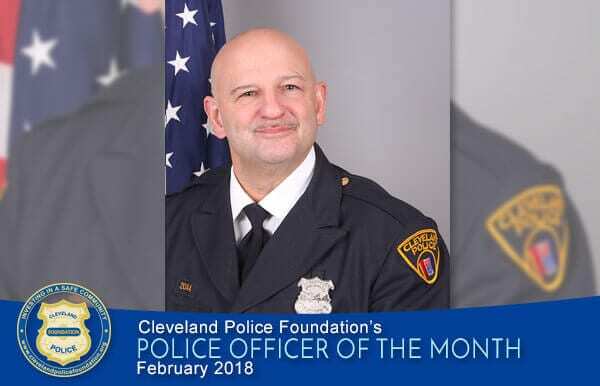 For his dedication to Cleveland Police Athletic League and devotion to the youth of the community, the Cleveland Police Foundation is honored to recognize Patrol Officer Joseph Haggerty as Police Officer of the Month for February 2018. “Service” is in Sergeant Tom Ross’ DNA… first as a U.S. Marine, and after an honorable discharge, throughout his long career with the Cleveland Division of Police. 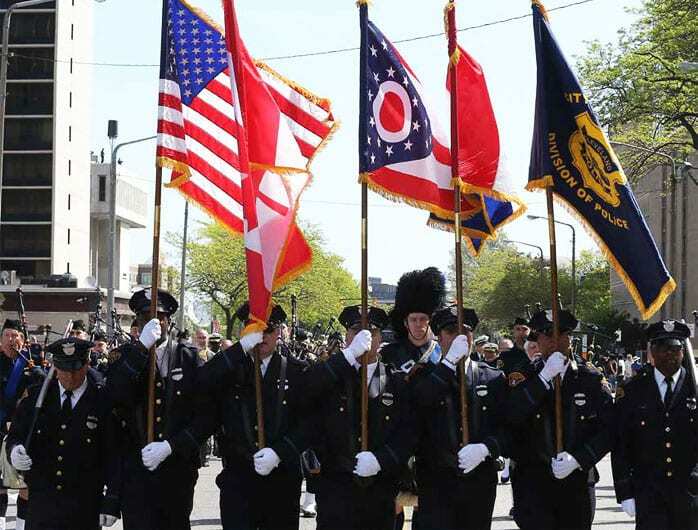 As a respected 17-year member of the Cleveland Police Honor Guard, he has represented the Division with distinction and pride at public ceremonies, civic events, and the funerals of officers who have died in the line of duty. Sergeant Ross provides behind-the-scenes leadership in the Honor Guard, including the HG’s 2016 trip to the National Law Enforcement Officers Memorial events in Washington, D.C., and this year’s trip for the addition of PO David Fahey’s name to the NLEOM in May. 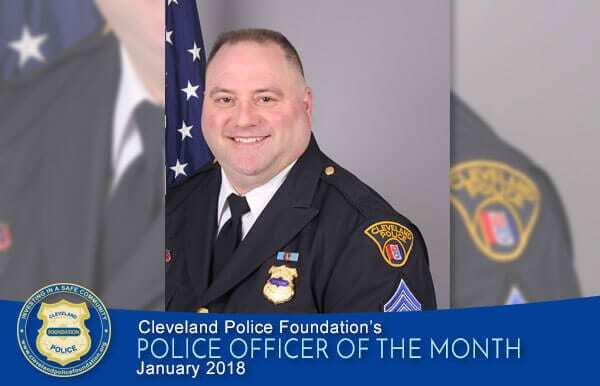 For his dedication to excellence and exemplary representation of the Division in public ceremonies, the Cleveland Police Foundation is honored to recognize Sergeant Tom Ross as its Police Officer of the Month for January 2018.